Buzzazz Business Solutions and Wabamm are both designed to help local businesses to flourish and prosper, and the desire to help in this way is fundamental to the way that Buzzazz operates. This goal comes from Keanan Kintzel, who has helped businesses in this way even before he formed Buzzazz with his brother Kurtis Kintzel, back in the nineties. All businesses benefit from building a stronger community, and when one business in a neighborhood starts to do better it actually has a knock on effect and brings more customers in. If you create a thriving scene where everyone knows that a place is the one stop place to get everything they need, you are going to have to beat them off with a stick. Clearwater has been doing a very good job in putting on events that cater to everyone, and bring new people into the place, so that the businesses and the area can keep growing. Everything that Buzzazz Business Solutions does is in alignment with this purpose. If you are local and you would like to find out how we can help you please contact us today. 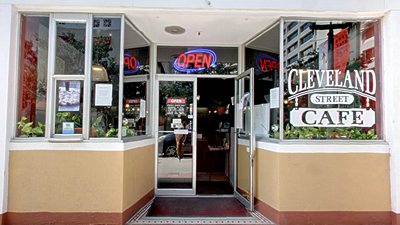 If you are looking for great Italian cuisine you can come and find Alessio at The Cleveland Street Cafe.